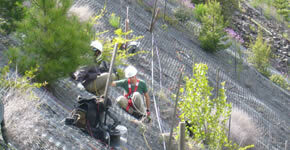 Geophysical prospection is a tool able to provide cost-effective and rapid collection of subsurface data. It is an essential and complementary ingredient in geotechnical studies (mandatory in building construction and most civil engineering studies). Carrying out the geophysical campaign first helps to select the optimum spots for the subsequent direct tests (drilling, trenching, sampling, etc), thus maximizing the collected data and diminishing its number (as opposed to a random selection of points). The most common applications in geotechnical studies are bedrock depth estimation, characterization of landslides, land rippability estimation, location of voids andfaults, etc. 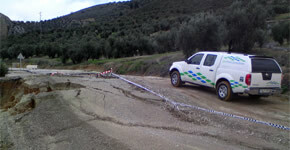 In these kind of studies, the main advantage of geophysical techniques are their non-invasive character. Moreover these studies allow to interpolate and extrapolate data obtained from drillings and to delineate areas of special interest where further ampling may be needed. In contaminated land studies, geophysical surveys can expedite site characterisation by providing models that map variations in physical properties of the subsurface. The use of specific geophysical techniques in archaeological studies has to advantages: firstly, its non-invasive nature and secondly the ability to map large study areas in short periods of time. Preservation and protection of cultural heritage sites requires tools that can maximize the amount of information with reduced economical impact on ever decreasing budgets. 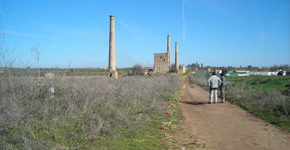 These techniques can be applied during any phase of an archaeological fieldwork (discovery and location, restoration, etc). Geophysical methods are amongst the most important tools in mining exploration because they are very sensitive to the characteristic signals that ore bodies produce in measured field data. The use of these techniques allows to delineate exploitable areas, quantify reservoirs, or determine degrees of alteration.